awesome stuff so far. I gotta say, I'm all for the in-game ads, but I just have a few questions/concerns. The first is, since the ads are provided by a server will you always have to have a constant internet connection to play or will you still be able to play in offline mode for LAN parties? Also, I've heard that ad servers can sometimes be hacked to download viruses to viewers, I'm not sure if that's fact or myth though. lastly, I've also heard that most ads are pay per click rather than view, how will this work out? Really, the ads aren't important though right now, seeing as the game isn't even close to being finished yet. Anyway, I'll have to hit ya up on IRC sometime. oh yeah, I was also wondering if there was any plans for a potential single-player campaign? I know there wasn't for any of the other TC games as far as I know, but hey, it could attract a few more gamers. I've been putting some thought into this myself. For one, there will definitely be no DRM. You can play the game without a connection at any time, even at LAN parties. The ads will be replaced by the splash screen for the game. The heckling of terms will occur when it's actually relevant to the continuation of the game. I'm interested in making money, but I'm not interested in exploiting the players in way they wouldn't be happy with. To be honest, I don't even know how practical it will be. Sure, it's an idea, but the feasibility is far from determined. sweet, that sounds like a great plan! Thinking back to other successful online first person shooters, I think solid having solid game play with not too hard of a learning curve (but not too easy either, ie COD) and the ability to become pro through hard competitive work is probably the most important. I'm just thinking of how successful Counter-Strike and TF2 have been. Also if a ranked matchmaking service could be implemented, that'd be super awesome. Urban Terror has also done pretty well and I think is similar to TC in the way it was built. I don't know about ranked matchmaking - at least for now. Those require a lot of servers around many regions, and a lot of resources to keep up and running. Combat Arms has done well for itself, at least as far as I can tell. I might download it again and see what they're doing right. Bit of an update. 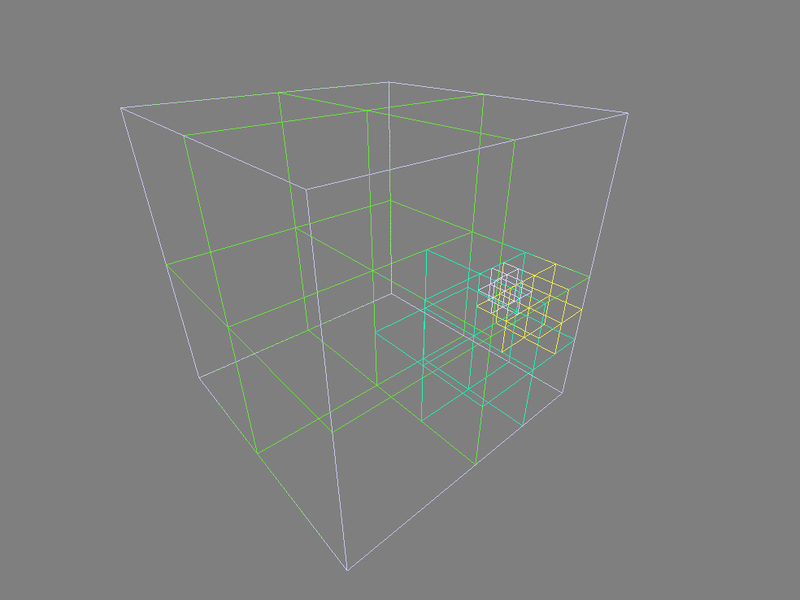 I have octree construction (somewhat) working. Before I get to the meat of the generation, I wanted to be able to visualize them. So here they are! The depth of the tree is color graded using a hue shift. They're also drawn backwards so there's no z-fighting it looks really great. Just keeping you guys up-to-date by saying that I'm still working on this. However, I've been quite distracted by a freak string of accidents and deaths recently of my friends. Quite nerve wracking. My condolences friend. You'll overcome that, life goes on. Indeed it does the viewing is today and the funeral is tomorrow. I should have a lot more time after that. Crazy how much you realize a person affected you once that person is gone. I've been doing more work with the renderer. Right now I'm pretty fed up with GL, so I'm going to quickly write my dx9 implementation and continue working with that. I'll have GL working later on, of course. So what do you guys think of voxel terrain? The tools aren't created yet, so there is room for experimentation. To be honest, I think games have a better chance of adopting REYES than pure voxel raytracing. The step to using micro-polygons is far less. For terrain, however, it's okay. Octrees are the only sane way to create and manipulate voxels, so it's not like they're impossible and completely useless. The "Unlimited Detail" thing is definitely 90% marketing, though. Nothing more than a cool tech demo. One of my friends recently got a job at Euclideon, though, so I can't complain too much Really sad to see Australia giving out grants like this. The death of the entrepreneur. Forget about voxels. Don't even bother with them. As much as they look good to properly manipulate with them you will come into alot of problems. Voxels are old as hell too. First thing that used voxels I could find was the game Outcast from 1999. Yes, the ground looks pretty damn cool for it's age, doesn't it? Yes it does. Problems? The game had to have small rendering distance. The game already required a powerful Pentium 3 processor which was one of the best you could get in those times. Another problem was the resolution - you couldn't set it higher than 800x640 or something like that if not lower. Later only there was released a third party patch to improve the resolution. You might say the technology has evolved... Well, it has. Voxels would still require a powerful processor especially if we wanted it to look "non-jiggly" as the camera moved. Well, if you have played any games that have voxel technology in them, you will understand. It's just totally not worth it. Yeah well said, Haraldzz. Regarding the jaggies when moving, though, a lot of people say that if you want MSAA it'll require more samples than it would otherwise. Up to several times more samples, in fact. Each sample is a ray cast, which is expensive. You're already doing one for every pixel on the screen. I contend that MSAA is only good for an antialiasing factor of 2x. Beyond that, use some weak FXAA for a post-process filter. It tends to slightly blur some stuff, which I almost find desirable in many cases. Another issue that people don't tend to bring up is lighting. The "big" thing about voxels is that they're inherently able to do ray cast lighting and shadows, which is cool, but also stupid expensive. Someone advocating for voxels is nearly as absurd as someone advocating for realtime Mental Ray renders with super max settings. It's just simply not going to happen, at least anytime soon. So the solution is to just use static lighting for voxels, and I guess deferred lighting for dynamic lights. The big (and I mean BIG) issue with doing static lighting on a per-voxel basis is that it would disallow you from reusing voxels. All voxel lighting information is unique, which means that all voxels must be unique. There are some ways around this, but they're all kind of hacky and still consume tons of storage space and memory. Once again, we have a better chance of adopting REYES. Now that my voxel rant is over I will admit now that I am having trouble determining whether I want 100% realtime or to go with megatextures. I am getting pretty disappointed with the artistic quality of shadows when using shadow maps. One of my friends even told me he prefers baked lighting because it gives him more artistic control.